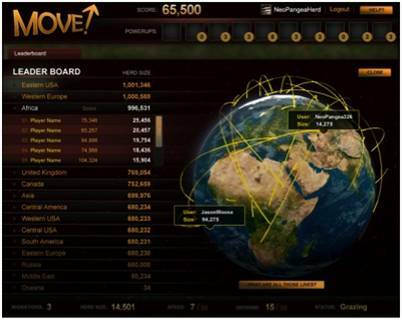 Nat Geo's Great Migrations Serious Game – MOVE! A new Social "Serious Game" is being hosted at the NGC website as part of the promotion for their upcoming seven-part series, Great Migrations that begins November 7. Narrated by Alec Baldwin, the series is the biggest programming event in the Channel's history, taking over 3 years to make and tracking over 420,000 miles of animal migrations across 20 countries in all seven continents. Great Migrations Social Game MOVE! 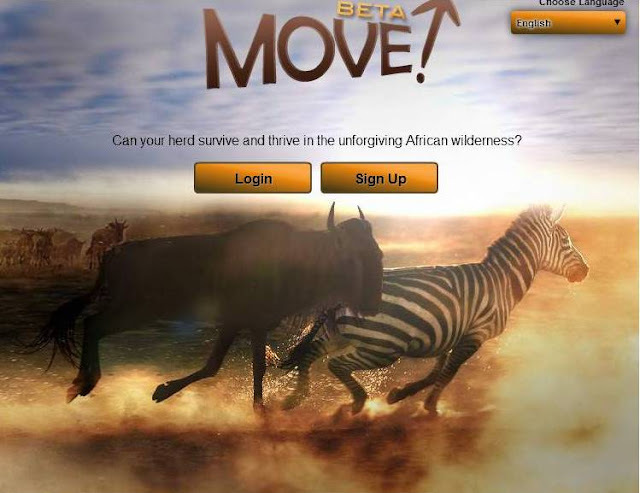 extends the magnificent experience of Great Migrations online via social game, and simulates the zebra and wildebeest migration. ﻿MOVE! puts the viewer at the head of the herd and challenges each herd to survive the 150-mile trek through a salt and sand desert hundreds of zebras make in Botswana and complete the 300-mile journey wildebeest make across Kenya and Tanzania each year. Players can participate in one of 14 regional teams that will be playing real-time across the globe, and invite Facebook friends to join to build the biggest herd and complete the most migrations. In Celebration of the Global Programming Event Great Migrations, Premiering Sunday, November 7, 2010, ‘Move!’ Puts the Viewer at the Head of the Herd and Brings to Life the Arduous Journeys Zebras and Wildebeest Take Each Year. Join one of 14 Global Teams! (WASHINGTON, D.C. – OCTOBER 25, 2010) In celebration of the seven-part global programming event Great Migrations, which premieres on National Geographic Channel (NGC) on Sunday, November 7, 2010, NGC has partnered with digital agency Neo-Pangea to extend the magnificent experience of Great Migrations online with the social game MOVE! Simulating the zebra and wildebeest migration, MOVE! puts the viewer at the head of the herd and challenges each herd to survive the 150-mile trek through a salt and sand desert hundreds of zebras make in Botswana and complete the 300-mile journey wildebeest make across Kenya and Tanzania each year. 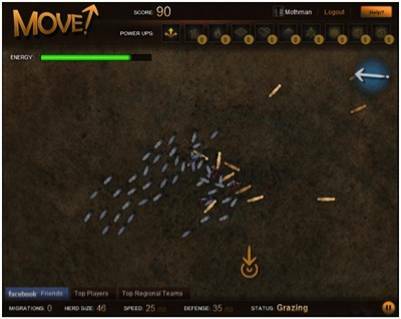 Players can participate in one of 14 regional teams that will be playing real-time across the globe, and invite Facebook friends to join to build the biggest herd and complete the most migrations. With potential risks looming at every turn — from unforgiving terrain to ferocious predators — the decision to keep moving or stop to graze could be one of life or death. The rain compass will guide players toward the migratory path, while the visualization of other migration leaders will allow players to “power up” when strength in number becomes crucial for survival. The most ambitious television event in the network’s history, Great Migrations is a seven-part global television event that premieres November 7, 2010, at 8 p.m. ET/7 p.m. PT and includes four core hours chronicling epic animal migrations, narrated by two-time Emmy, three-time Golden Globe winner Alec Baldwin. Additional hours include a scientific investigation of animal migrations; a behind-the-scenes look at the advanced technology, dramatic challenges and passion required to capture these spectacular shots; and a music hour, Rhythm of Life, set to original music by film and television composer Anton Sanko. Based at the National Geographic Society headquarters in Washington, D.C., the National Geographic Channel (NGC) is a joint venture between National Geographic Ventures (NGV) and Fox Cable Networks (FCN). Since launching in January 2001, NGC initially earned some of the fastest distribution growth in the history of cable and more recently the fastest ratings growth in television. The network celebrated its fifth anniversary January 2006 with the launch of NGC HD, which provides the spectacular imagery that National Geographic is known for in stunning high definition. NGC has carriage with all of the nation’s major cable and satellite television providers, making it currently available in more than 70 million homes. Neo-Pangea is an innovative digital agency that specializes in digital video production, Web design, 3-D design, interactive experiences and live-environment multimedia. It has created successful promotions for Fortune 100 brands across the globe such as National Geographic Channel, Comcast and Wal-Mart.